Urban Archeologist: A little song, A little dance....A little seltzer down your pants - Happy Saint Patrick's Day! A little song, A little dance....A little seltzer down your pants - Happy Saint Patrick's Day! Do yourself a favor this weekend. 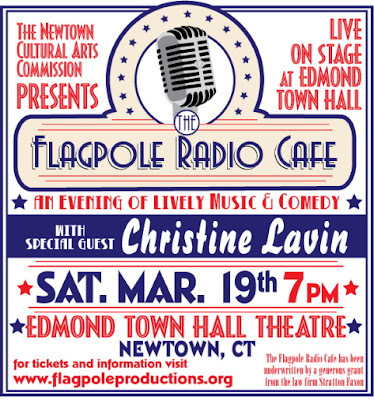 Take a trip this Saturday night to Newtown, CT and see a great show that is 99% home grown. The Flagpole Radio Cafe is a rousing good way to spend an evening out. This next show features a double dose of Music & Comedy with not only the regular cast of performers but also Christine Lavin. If you are unfamiliar with her work take a quick look here. Well that was the "Song" and "Seltzer down your pants" protion of this post; now, here is the dance. I have been splitting valuable blogging time with my Cartooning. I decided to begin a new blog just to find a place to display my creations. Take a look at "Toonage" (Though the address reads something else because "toonage" was taken!) I will be adding more of my Doodles, Sketches, and accidental Rorschach disasters, along with some guest artists. My bloglist at the right will always display new updates by bringing them to the top. Have a Happy St. Pat's! Gettin' Irish Jiggy with it! Yes, I drew it last year.